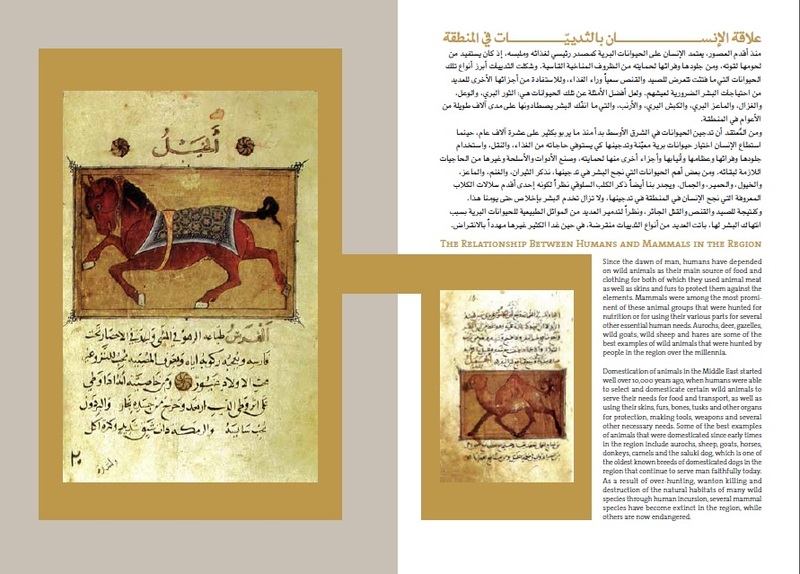 ‘Field Guide to the Mammals of the Middle East’ (released 2015) is an accessible text suitable for graduate students and professionals in the fields of mammal biology, conservation biology, and ecology, as well as nature conservation practitioners and mammal specialists. The Book will be launched in several countries during the upcoming weeks. Mammals of the Middle East command a high level of public attention, reflected in specific legislation for their protection and management in many countries. They also present particular challenges to ecologists and conservation biologists. They are mostly difficult to observe, there are often perceived conflicts between mammals and people, and furthermore several species are now close to extinction. Written by Assad Adel Serhal and Saeed Abdulla Alkhuzai. This guide cover all 200 terrestrial and marine mammals recorded in the Middle East, particularly in Arabic-speaking countries. To reach a wider audience, the text is both in Arabic and English. This guide is not limited to only being the first of its kind in form, content, its scientific approach and coverage of all mammals of the region, but it is also characterized by the ease and clarity of its information and the ability to identify the animals in the wilderness from their physical description, measurements, favourite habitat, behaviour, breeding, food, etc. . It also includes coloured plates and illustrations of each of these species, races, skulls and footprint when it is available. 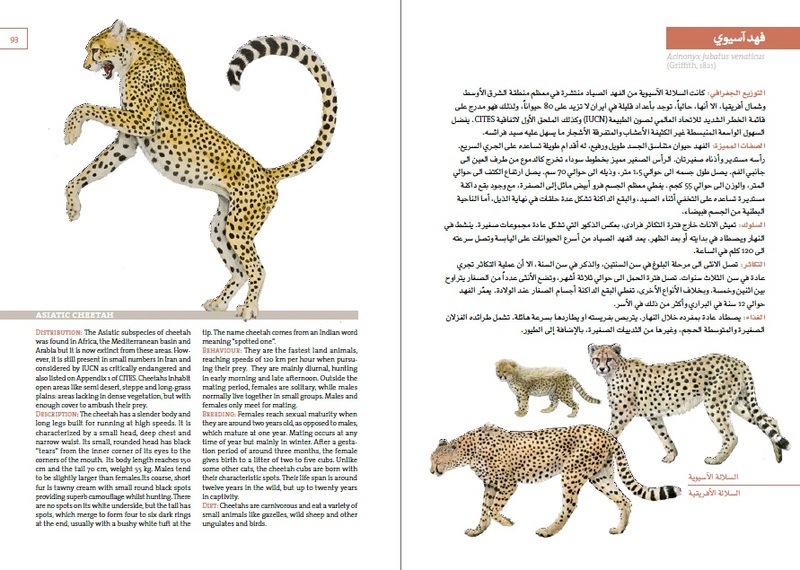 One of the major challenges that we faced during our work on this guide was how to access the best drawings for the mammals of the Middle East at the international level. Fortunately, we have managed to receive the permission to use more than 500 coloured illustrations of all these animals, including their adult forms, adolescent forms baby forms, and different genders, as well as renderings of skeletons, tracks and excrement to make their identification in their natural habitat. We resorted to our international relations to reach our aim. Therefore, we would like to thank our friend Steven Ramsey for providing us with his private collection, the famous Mammals of Arabia artwork by the international artist Jonathan Kingdon, and our friend Joseph Del Hoyo, who aided us in receiving permission to use the artwork of the Spanish artist Juan Varella and the latest artwork used in the Lynx Publication: Handbook of Mammals especially ungulates, carnivores and marine mammals. We also like to thank UK Collins Publisher for providing the plates of rodents and bats, which is published in the famous book, Mammals of Britain and Europe. We also sought the support of the promising Lebanese artist, Karim Farah, who provided a collection of drawings for the movements of some animals, in addition to the art direction of the guide and the cover. He was a very patient colleague, following us through the production of this work for more than seven years. We offer him our thanks and appreciation. We also like to extend our thanks to Mrs. Andrée Vérès for providing access to some plates, Mrs. Karen Wade for proofreading the English text, Mr. Ramzi Saidi, SARI Establishment and Mrs .Malake Daher for their contribution in translating certain parts of the text,. We would also like to thank Mrs. Alexandra Abdul Malik for coordination and follow up, Mr. Sami Tarabai for technical assistance and Ms. Raghad Tariq Jaber for helping in related references. 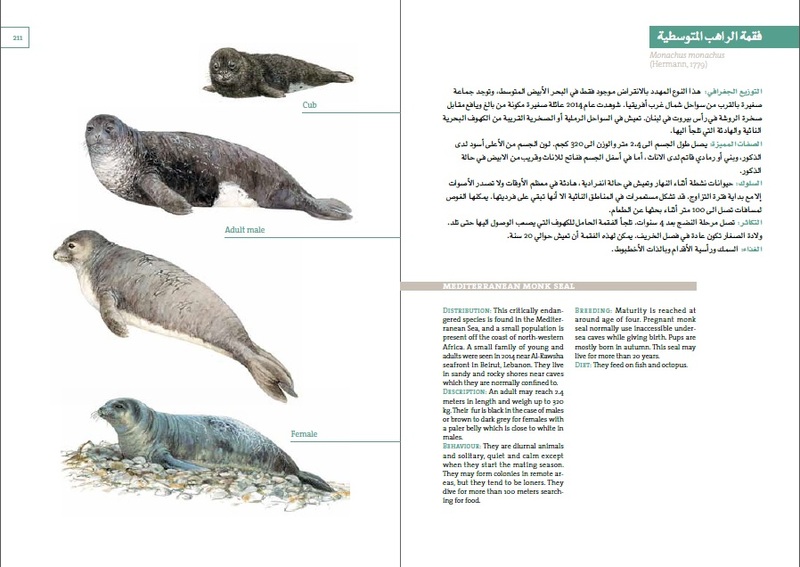 This guide focuses on 200 species of terrestrial and marine mammals whose existence is confirmed in Arabic-speaking countries in the region known as the Middle East, where land is surrounded by many bodies of water, including the Mediterranean Sea, the Red Sea, the Arabian Sea, the Gulf of Oman and the Arabian Gulf. We also tried to cover all habitats including sea, coast, forest, mountains, valleys, desert and marshes. For descriptions, the measurements of body and tail length were indicated in centimeters (cm), as shown in each figure and body weight in kilograms (kg), in addition to colours of fur and its variation. We also tried to compare species present in the region or with those occurring in adjacent regions like South Europe and the Eastern side of the Arabian Gulf. Issues related to behaviour indicated are time of activity, seasonality, places the species inhabit and ability to dig, climb, swim, etc. The breeding section includes maturity, breeding season, gestation period, number of babies and lifespan. For feeding, the main type of diet is highlighted in the text. As conservation and protection is an essential message here, we depended on the IUCN Red Data List for threatened species. Accordingly, the status of each mammal is considered in relation to what is indicated by the categories of the IUCN based on the time this book was published.